Marine satellite communications for South America coastal waters. 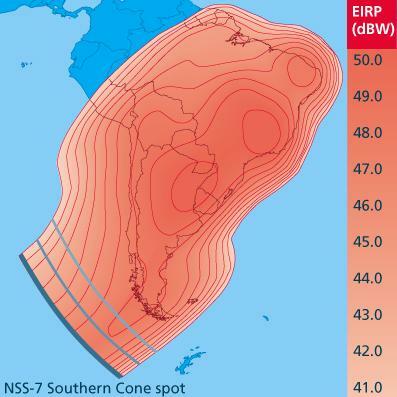 Telenor have a satellite broadband service for South America waters using NSS7 coverage. It is being used successfully by Engenharia Eletr�nica Marinha who use it for marine applications in Brazilian, Argentinian and Chilean coastal waters. The service is called Wavecall by Telenor, using Wavecall 4003 4006 equipments and pointing to NSS7 satellite at 22 deg West orbit longitude. 52 degrees south, with satellite beam elevations as low as 14 deg.